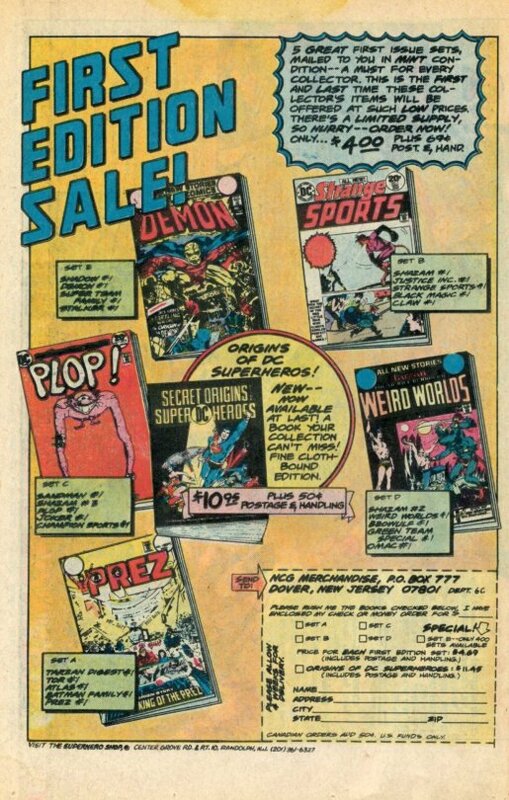 I have no great memories of FOUR STAR SPECTACULAR #4. It was a perfectly fine comic book, one of hundreds that I’d purchase in the years to come, but not especially noteworthy to me apart from the minutes of entertainment that it provided. This may have been because, while I liked them all just fine, Superboy, Wonder Woman and Hawkman weren’t particular favorites of mine. Still, the call of a giant-size reprint comic was irresistible. The issue opens with a classic early Wonder Woman story by creator William Marston but illustrated not by the series’ visual originator H.G. Peter, but rather the more polished Frank Godwin. 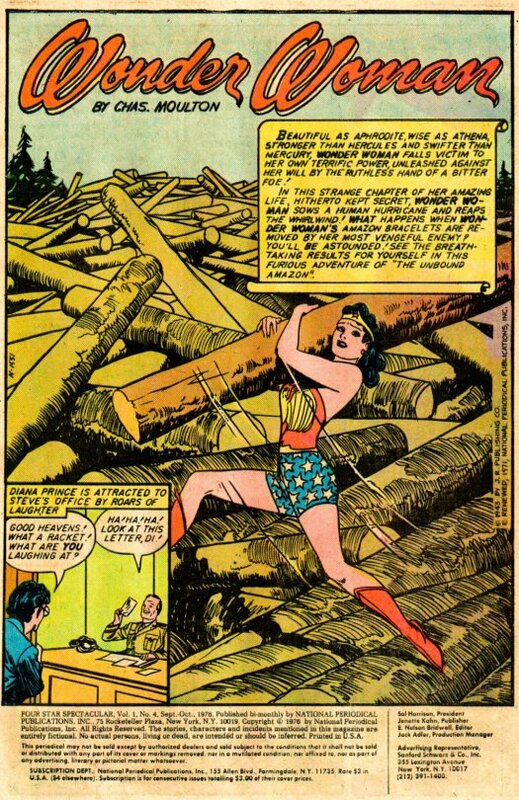 Godwin did a string of Wonder Woman stories for a short period of time but failed to become a fixture on the series. His style was more contemporary than Peter’s, and you can almost see somebody up at the All-American offices trying to make Wonder Woman more visually appealing to a then-modern audience. I have a real love of the early Wonder Woman stories, they’re the most appealing to me in terms of their conception and strangeness. This one introduced an important element to the mythos: in it, the villainous Mavis cut off Wonder Woman’s Amazonian bracelets, thinking that it would deprive her of her strength. 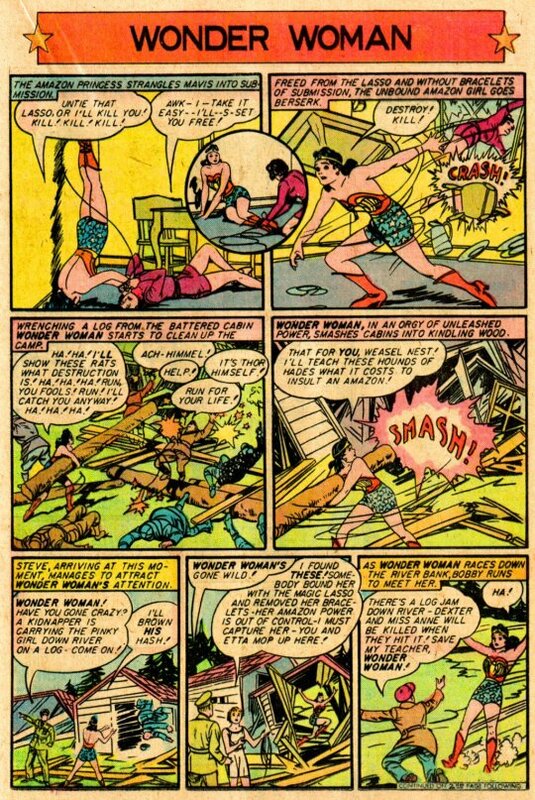 But instead, this unshackled it, causing her to run amok and “destroy like a man.” Fortunately, by the story’s end, Paula, the Amazon scientist, is able to contain Wonder Woman within her own magic lasso until the bracelets can be reforged. Next up was a forgettable Superboy story, and I confess that I had forgotten everything about it until pulling it out for this report. This tended to be my pattern with Superboy tales, at least the ones produced before the ascendance of Mort Weisinger and the introduction of the Legion of Super-Heroes. They’re inevitably well-crafted tales centering on small-town life but without the sort of colorful villains and fantastic situations that would make them especially memorable to me. 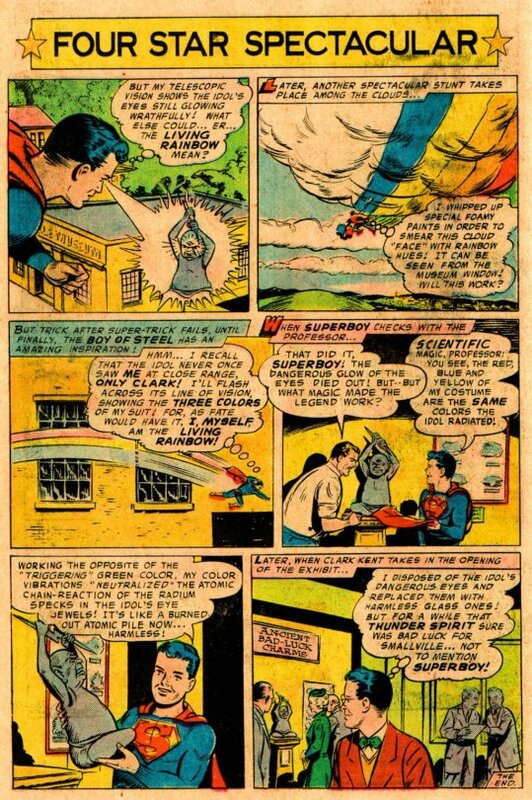 In this one, Professor Lang has brought back to Smallville an idol of the Thunder Spirit which is infused with Radium, somehow causing it to create disruptions to the weather when certain colors are put in front of its gemstone eyes. 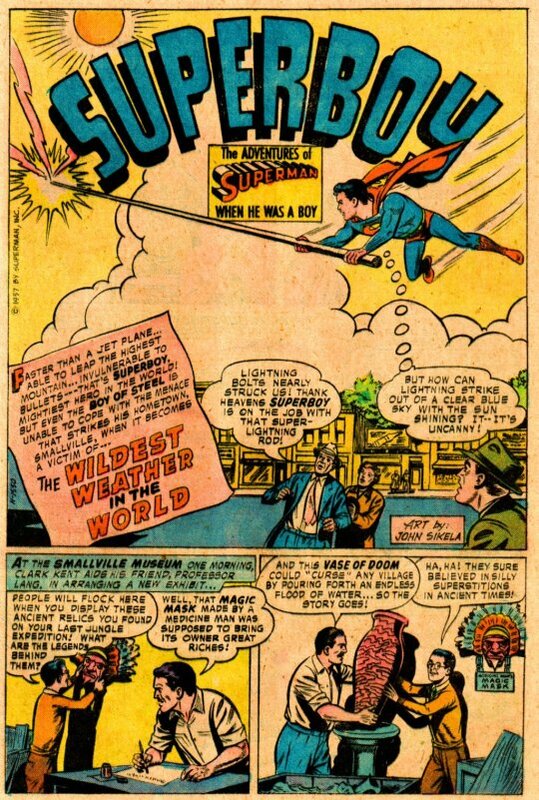 Legend says that only the “living rainbow” can quiet the angry spirit of the idol–and this turns out to be Superboy himself, whose action-costume contains the necessary primary colors to make the magic work. It’s all very scientific in a completely ridiculous comic book way. 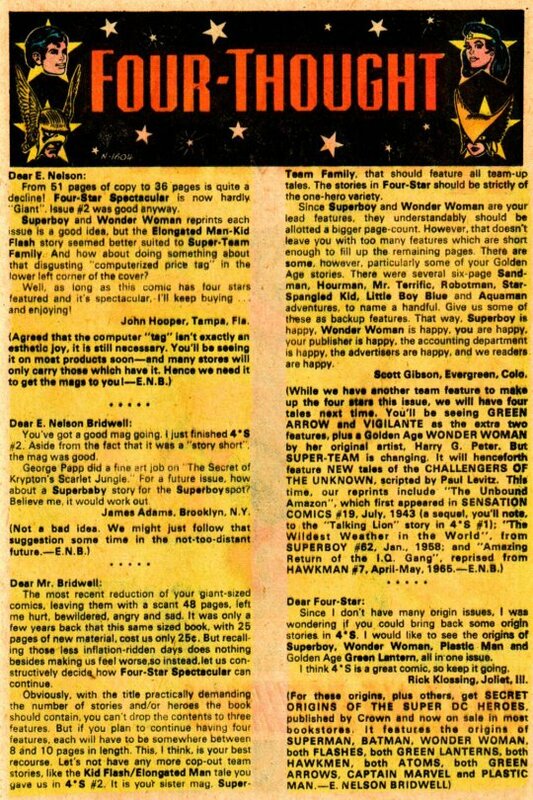 Next came the issue’s letters page, written by editor E. Nelson Bridwell, and where I first learned of the existence of the hardcover SECRET ORIGINS OF THE SUPER DC HEROES book which had just then been released. Oh, how I lusted after that book, but I would need to wait most of a year until Christmas before I’d get my hands on it. 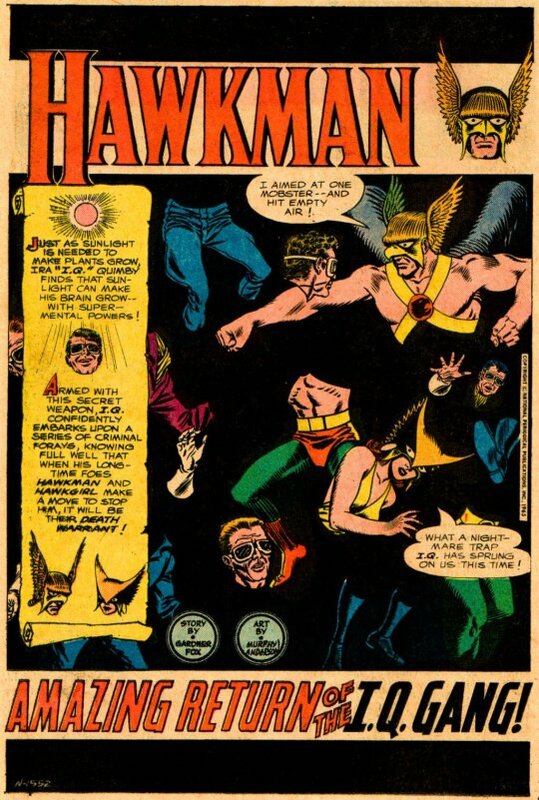 The final adventure in the issue was a Hawkman tale illustrated by Murphy Anderson. Anderson’s work was perfectly in line with the clean, open sheen that was the DC “look” in the 1960s and which was enormously appealing to me. Yet, somehow, his figures were always just a little bit lifeless, a little bit stiff. In rendering them so finely, Anderson robbed them of some of their movement and energy, I felt. So it was good-looking work, but kind of cold. 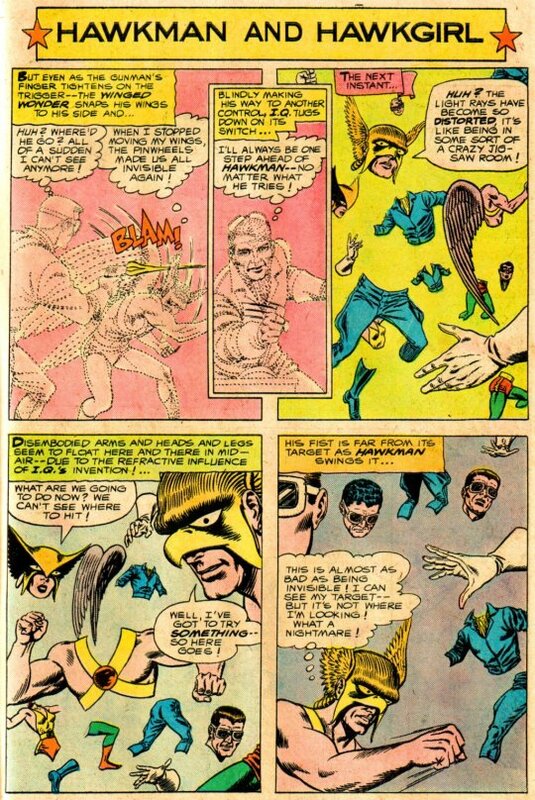 This story featured a return engagement with Ira “I.Q.” Quimby, whom I’d seen Hawkman contend with in an issue of WORLD’S FINEST previously. Here, his sunlight-energized super-intellect allows him to create a series of visual effects and super-gadgets with which he and is men embark on a crime spree. The Winged Wonder and his wife Hawkgirl take up the challenge and battle through as much by their wits as their physical prowess. It’s almost a quintessential Silver Age DC super hero tale.